What does a drafter do? If you like the idea of working at a computer to design, you might enjoy drafting. 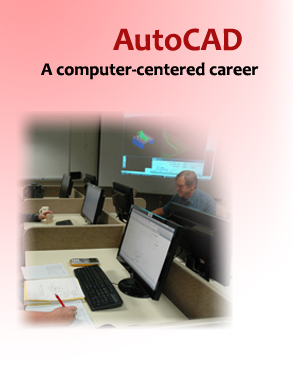 Drafters prepare drawings or plans on the computer for manufactured products using Computer Aided Design (CAD) systems. These plans can be stored, viewed or printed and changed easily until the plan is approved and transferred right to the automated manufacturing system. The drawings made by the drafter incorporate the technical details called for by the engineer’s calculations and specifications, which makes it important for the drafter to understand manufacturing theory and standards. Drafters may work in sales support to illustrate product design or may be asked to help prepare proposals for new products, sometimes developing 3-D models for analysis. There are many areas for employment in drafting, but according to the US Department of Labor’s Occupational Outlook Handbook, “25 percent of jobs were in manufacturing industries such as machinery manufacturing…” You may also work for a consultant, an outsource or engineering services firm, a military installation or a research organization. The Handbook gives a growth rate of 11% for all drafting positions nationally, and states that those with training beyond high school or a two-year degree will find the best prospects.